Imagine you’re heading home from work, and as you get close to your apartment building, a message pops up on your smartphone asking if you want to turn on the lights. You click “yes,” and when you get home, the lights are on. 퇴근 후 집으로 향하는 길. 아파트 단지에 가까워지자 스마트폰에 “집안 불을 켤까요?”라는 메시지가 나타난다. '예스' 버튼을 누르자 불이 켜진다. At the main entrance of your apartment building, the door opens without you having to reach for your key card. The elevator is already heading down to the first floor, thanks to a camera that detects your entry into the building. 아파트 입구에 도착하니 출입문이 자동으로 열린다. 예전처럼 카드 키를 꺼내기 위해 주머니를 뒤질 필요가 없다. 엘리베이터는 이미 1층으로 향하고 있다. 당신이 다가오는 걸 아파트 입구에 있는 카메라가 포착한 순간 자동으로 내려온 것이다. When you get to your apartment, the curtains come down as soon as you step in. The coffee machine right on cue starts grinding the Guatemalan beans you ordered a week ago. The thermostat adjusts the room temperature to your liking; a mild breeze flows from the air-conditioner. 집 안에 들어서니 커튼이 저절로 내려온다. 커피 머신은 일주일 전 주문한 과테말라산 커피 원두를 갈기 시작하고, 온도조절기는 집안 온도를 당신이 좋아하는 정도로 맞춰 준다. 에어컨에서는 선선한 바람이 나온다. As you’re taking off your shoes, you ask your voice-activated virtual assistant smart speaker to turn on the news, and the television switches to the news channel. The main story of the day is worsening air pollution. You tell the assistant to turn on the air purifier, and it obliges. 신발을 벗으면서 가상 비서인 스마트 스피커에 최신 뉴스를 틀어달라고 하자 거실 TV에서 뉴스 방송이 나온다. 오늘의 주요 뉴스는 악화하는 공기 오염. 스마트 스피커에게 공기청정기를 틀어달라고 하자 곧바로 작동한다. Then off to the showers, where the water turns on automatically. While you’re washing up, the apartment’s smart home system tells you your car is entering the building’s parking lot, letting you know your spouse has returned from work. 샤워실에 들어서자 물이 자동으로 나온다. 씻고 나오니 스마트 홈 시스템이 아내의 차가 주차장에 들어왔다고 알려준다. After your shower, you head to the refrigerator to grab something to eat. It tells you that you’ve run out of eggs, and you immediately place on order for more on the fridge door’s digital screen. 샤워 후 뭘 좀 먹을까 하며 냉장고로 향한다. 그러자 냉장고는 계란이 다 떨어졌다고 말한다. 당신은 냉장고 문에 있는 디지털 디스플레이를 통해 계란을 새로 주문한다. You pick up the coffee that has been brewing the whole time and slip into the sofa as your spouse walks through the apartment door. 다 끓여진 커피를 들고 소파에 앉는 순간 아내가 집안으로 들어온다. While the story above might sound like the stuff of science fiction, the technologies described already exist and will be available in so-called smart home apartments being built by Hyundai E&C at its Hillstate complex in Dongtan, Gyeonggi. 공상과학 소설에나 나올 법한 이야기라고 생각할 수 있겠지만 이런 기술은 이미 존재하며, 현대건설이 동탄에 현재 건설 중인 힐스테이트에 적용될 예정이다. The apartment began accepting buyers last June, and 2만9000 residents will be ready to move in by February 2019. The technologies in the homes are a collaboration between Hyundai E&C and leading Korean telecommunications provider SK Telecom. 지난해 6월 분양을 시작한 이 아파트에는 2019년 2월까지 2만9000가구가 입주할 예정이다. 이 아파트에 적용되는 스마트홈 기술은 현대건설과 SK텔레콤의 협력으로 이뤄진다. According to the companies, the smart home services are based on machine learning technology where devices can analyze residents’ data, including location information, daily habits and even sleep patterns, to customize service for the convenience of residents. 이 스마트홈 서비스는 머신러닝 기술이 적용됐으며, 위치 정보·개인 습관·수면 패턴 등 입주자들의 개인 데이터를 분석해 맞춤형 서비스를 제공함으로써 입주자들의 편의를 높인다는 게 업계의 설명이다. SK Telecom and Hyundai E&C aren’t the only IT and construction partnership collaborating on smart homes. Last month, the Gyeonggi Urban Innovation Corporation and KT, Korea’s second-largest telecom company, signed an agreement to install smart home features in a public housing complex in Dasan New City in Namyangju, Gyeonggi. SK텔레콤과 현대건설 뿐 아니다. 다른 IT업체와 건설사들도 스마트홈 분야에서 협력을 강화하고 있다. 지난달 경기도시공사와 KT는 남양주 다산신도시 공공주택에 스마트홈 기술 도입에 관한 업무협약을 체결했다. The technology will let residents control refrigerators, air purifiers, robotic cleaners and basic infrastructure like gas, heating and lights through a mobile app. 새로 적용되는 기술을 적용하면 냉장고·공기청정기·로봇청소기는 물론 가스·난방·전등 등의 인프라 시설들까지 모바일 앱을 통해 조정할 수 있다. Just 10 years ago, a lot of this would have been unthinkable. Back then, the most modern features in a home were electronic keypads that could lock and unlock doors and touch-screen displays that showed who was at the door and ring them in. 불과 10년 전만 해도 이런 기술은 상상도 할 수 없었다. 당시엔 가장 최신형 아파트조차 전자 키패드를 통해 외부 출입 문을 열고 닫거나 터치스크린을 통해 방문자를 확인하는 정도였다. Now, both devices are ubiquitous in Seoul apartments, one could even say passé, a testament to how quickly home technology has developed in the past decade. 하지만 이제 이런 기술들은 서울 지역 아파트 어느 곳에나 발견할 수 있다. 지난 10년 간 기술이 얼마나 발전했는지를 알 수 있는 대목이다. Televisions have become smarter, giving viewers access to a wide variety of on-demand entertainment and the ability to shop through a remote control. 그동안 TV는 각종 주문형 엔터테인먼트를 제공할 만큼 스마트해졌고, 간단한 리모컨 조작으로 쇼핑이 가능할 정도로 발전했다. But if the previous wave of home technology was about giving residents the option to digitally integrate their home devices, the next wave is about making those machines work for each individual’s needs. 과거 홈 테크놀로지가 디지털 기술을 가전 제품에 제공하는 수준이었다면, 최근의 신기술들은 집안의 기기들이 개인의 필요에 맞춰 작동하도록 한다는 점에서 다르다. It’s the difference between an air purifier that can assess the environment around it and an air purifier that can analyze and then adjust its settings automatically based on the user’s preferences. 가령 기존의 공기청정기가 단순히 현재의 공기 상태를 분석해서 관련 정보를 제공하는 것이었다면, 최근 나온 공기청정기들은 그 분석을 토대로 사용자의 취향에 가장 적합한 환경을 스스로 만들어 준다. 딥러닝을 연구하고 있는 한양대 정준혁 교수는 “스마트 홈이라는 표현은 10년 전부터, IoT(사물인터넷)이라는 개념은 대략 5년 전부터 있었다. 그러나 지금까지의 기술은 사물을 연결하는데 집중했을 뿐 그걸 통해 어떻게 편의성을 높일지에 대한 고민은 없었다”라고 말했다. Until recently, the professor said, most consumer electronics in smart homes, whether they’re TVs, humidifiers or robotic vacuum cleaners, had been controlled through smartphones. This means devices still rely on the command of humans, while a truly “smart” home, the professor argues, would have devices executing functions on its own. 정 교수는 또 현재의 TV·가습기·로봇청소기 등의 스마트홈 기기들은 스마트폰을 통해 컨트롤되고 있으며, 아직까지는 인간의 명령에 의존한다고 말했다. 진정한 스마트 홈 기기가 되기 위해선 스스로 명령을 내리고 실행해야 한다. Chang believes we are in the midst of a transition from smart homes capable of only connecting devices to smart homes that can work for us, largely thanks to rapid developments in artificial intelligence. 그는 우리가 진정한 스마트 홈으로 전환하는 단계에 있다고 진단했다. 기기들 간의 단순한 연결 단계에서 기기들이 우리를 위해 (스스로) 일하는 단계로 가고 있다는 것이다. 이는 인공지능(AI)의 빠른 발전 덕분이다. 그는 “스마트홈은 호텔 메이드가 방을 치워주고 빨래를 해주는 정도에서 우리 삶의 모든 부분을 보조하는 비서 역할로 발전했으며, 결국에는 가디언, 즉 인생 파트너로 우리와 소통하고 공감하는 수준으로 발전할 것”이라고 말했다. While one can point to any number of dystopian speculative fiction works involving sentient computers, Chang believes this function will play a crucial and positive role for an aging society like Korea’s where the number of senior citizens living alone is increasing. 지각 능력이 있는 컴퓨터 등장이 미래를 디스토피아로 만들 것이라는 우려도 있다. 하지만 그는 이런 기능이 특히 한국처럼 독거노인들이 빠른 속도록 늘어나고 있는 고령화 사회에서는 중요한 역할을 할 수 있을 것이라고 내다봤다. A study released by PwC in January shows that many people feel smart home technology will improve the quality of their lives. 글로벌 컨설팅 회사인 PwC가 올해 1월 발표한 연구 보고서에 따르면 많은 사람들은 스마트홈 기술이 삶의 질을 높여줄 것으로 기대하고 있다. About 26 percent of 1,000 Americans surveyed said their main motivation behind buying a smart home device was convenience, improvement in quality of life or to help them be more productive. 설문에 참여한 미국인 1000명에 가운데 약 26%는 스마트홈 기기를 구입하는 주요 동기가 편의성, 삶의 질, 생산성 향상이라고 답했다. The report noted that a handful of participants considered smart home devices as personal assistants that help them remember things they need to do. 보고서는 또 사람들은 스마트홈 기기를 우리가 기억해야할 것들을 기억하도록 도와주는 개인 비서로 생각한다고 언급했다. Market analysts say the smart home market has enormous potential for growth because it is still in its early stages and there is no clear dominant player. 전문가들은 스마트홈 시장은 성장 가능성이 높은 블루오션이며, 초기 단계인 현재로선 확실한 시장 선점 기업이 아직 없다고 말한다. 시장 조사기관 IHS마켓의 IoT 수석 애널리스트 크리스챤 킴은 “스마트홈 시장은 걸음마 단계를 지나 성장 단계에 진입하고 있다”며 “하지만 현재는 서로 다른 스마트 홈 기기들이 서로 소통하기 위한 각각의 솔루션들이 너무 많고 분산돼 있어서 특정 기술이 시장을 주도하지는 못하는 상황”이라고 말했다. According to a Strategy Analytics report, the global smart home market has been growing at an annual rate of 18.4 percent. The market, which was worth $40.6 billion in 2013, is expected to double to $82.1 billion by the end of this year and expand to $111.5 billion by 2019. 스트래티지 애널리틱스에 따르면 글로벌 스마트홈 시장은 연평균 18.4%씩 성장해왔다. 2013년 406억 달러 규모에서 올해 말에는 그 두 배인 821억 달러 규모로, 2019년에는 1115억 달러 규모로 확대될 것으로 보인다. 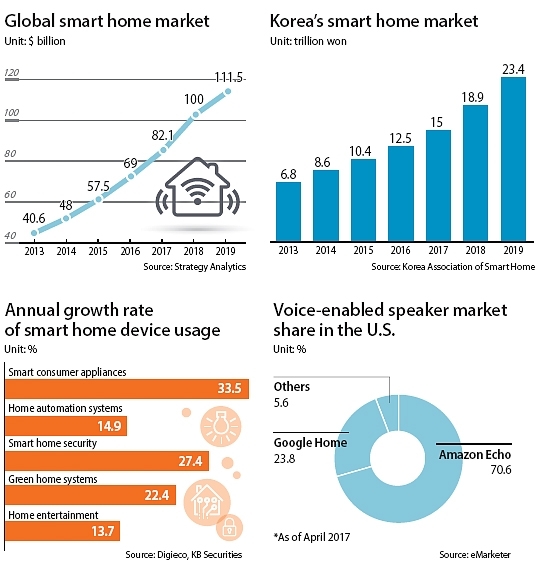 Korea’s market is growing at a faster pace, an average 23.7 percent between 2013 and 2015, according to a study by the Korea Association of Smart Home. The market, which will be 6.8 trillion won by the end of this year will be worth 18.9 trillion won and in 2019 further grow to a 23.4 trillion won market. 한국 시장은 더 빠른 성장세를 기록 중이다. 한국스마트산업협회에 따르면 한국의 스마트홈 시장은 2013~2015년 사이 연평균 23.7%씩 성장했다. 올해 시장 규모는 18조9000억원으로 추정되며, 2019년에는 23조4000억원 규모로 커질 것으로 전망된다. Asia in general has been the biggest adopter of smart home technology. Last year, the region accounted for 50.5 percent of the world’s smart home devices sold, selling more than 115 million products, according to IHS Markit. North America came in second with 30.7 percent and Europe 18.8 percent. 아시아는 스마트홈 기술 부문에서 가장 큰 시장이다. IHS마켓에 따르면 지난해 아시아 지역에서만 1억1500만 개의 스마트 홈 기기가 판매됐다. 이는 전세계에서 판매된 스마트 홈 기기의 절반인 50. 5%를 차지한다. 그 다음은 북미 시장으로 30.7%, 유럽은 18.8%였다. Among the world’s countries, China has been pushing especially hard on the development of smart homes. 중국은 전 세계에서 가장 적극적으로 스마트 홈 개발에 나서고 있는 나라다. According to a report by the Korea Trade-Investment Promotion Agency in May, the Chinese government is leading the world in smart home development, investing 1 trillion yuan ($150 billion) to construct 500 smart cities by 2020. 대한무역투자진흥공사(코트라)가 지난 5월 펴낸 보고서에 따르면 중국 정부는 1조 위안(약 165조원)을 투자해 2020년까지 500개의 스마트 시티를 건설할 계획이라고 한다. This plan is expected to boost the Chinese smart home market, which last year amounted to 60.5 billion yuan, a more than 50 percent increase from the previous year. Under such a government-led initiative, the Chinese smart home market is expected to be worth 139.6 billion yuan by 2020, making it the No. 1 smart home market in the world. 지난해 중국 스마트홈 시장 규모는 전년에 비해 50% 이상 성장한 605억 위안(약 10조원)이었다. 하지만 중국 정부의 적극적인 정책으로 중국 스마트홈 시장은 2020년까지 1396억 위안 (약 23조) 규모의 세계 1위 시장으로 성장할 것으로 전망된다. The Korean government already have taken such step when it announced of investing 98.9 billion won on converging Internet of Things technology such as wireless sensors with existing industries including home appliances, energy, health care, automobiles and manufacturing in 2015. Under the plan, the government covers 75.8 billion won and the remaining 23.1 billion won comes from the private sector. 한국 정부는 가전기기, 에너지, 헬스케어, 자동차 제조 같은 기존 산업에 무선 센서 등의 IoT 기술을 적용하는 융합기술 개발에 989억원 (정부 750억원, 민간 231억원)을 3년 간 투자한다는 계획을 2015년 발표한 바 있다. The local smart home market, however, is led by major businesses. 한국의 스마트홈 시장은 주요 기업들이 주도하고 있다. KB증권 김철영 애널리스트는 “전체적으로 봤을 때 [국내] 스마트홈 시장은 삼성전자나 LG전자 같은 대기업과 건설 및 통신 회사들이 협력하고 있는 형태”라고 말했다. 그는 또 “코스닥에 상장된 업체들 중 스마트홈 분야로 진출하려는 업체는 많지 않다”라고 덧붙였다. Kim said the smart home market is centered largely on conglomerates because they already make consumer appliances with internet connectivity. Therefore, it would be less profitable for smaller companies to jump into the smart home market. 가전제품을 생산하는 대기업들이 인터넷에 연결되는 가전제품을 만들어 내고 있으며, 이 때문에 중소기업이 스마트 홈 시장에 뛰어든다고 해도 수익을 내기 어렵다는 게 김 애널리스트의 분석이다. Some small companies like SeoJin Network only sell smart home devices that are developed in China. 서진네트워크 같은 중소기업은 중국에서 개발한 스마트 기기를 판매한다. Seojin Network is a Korean company that specialized in wire and wireless connectivity products like router and LAN card. The company signed a contract with the Chinese smart home developer BroadLink in December in selling smart home devices in the Korean market. 서진네트웍스는 유무선 공유기나 랜카드 등을 다루는 회사다. 이 회사는 지난해 12월 중국 스마트 홈 개발업체 브로드링크와 계약을 체결하고 한국 시장에 스마트홈 기기를 판매하기로 했다. “Considering the market situation, we thought it would have the potential in selling smart home appliances,” said David Lee, technical sales manager at the company. BroadLink will be available in the Korean market starting September. 서진네트웍스의 데이비드 리 테크니컬 세일즈 매니저는 “우리는 한국이 스마트홈 분야에서 잠재력을 갖고 있는 시장이라고 판단했다”고 말했다. 이 회사는 오는 9월부터 브로드링크의 스마트 홈 기기들을 국내시장에 판매할 계획이다. Other major Korean companies like Samsung and LG are either collaborating with global companies or acquiring them. 삼성이나 LG등 국내 주요 업체들은 해외 업체들과의 협력도 강화하고 있다. The most notable move was made by Samsung Electronics, when it acquired the American start-up SmartThings in 2014 for $200 million. 삼성전자는 2014년 미국 스타트업 스마트싱스를 2억 달러에 인수해 주목받았다. SmartThings was founded by Alex Hawkinson in 2012, and its key product is the Hub, a router-like box that can connect different third-party smart devices and make them work together, almost like a digital translator for products. 스마트싱스는 2012년 알렉스 호킨슨이 창업한 회사로 이 회사의 주요 제품은 스마트 허브다. 이는 각각 다른 스마트 기기들을 연결해 주는, 기기 간의 디지털 통역기 역할을 한다. 인수 당시 호킨슨은 자신의 블로그에 “우리의 목표는 개방된 스마트홈 플랫폼을 개발함으로써 개발자, 기기 개발자 그리고 소비자를 한 곳으로 모이게 하는 것이다. 우리는 우리의 비전을 지원하는 삼성을 환영한다”고 밝혔다. Currently, the product is only available in the United Kingdom and United States. According to a Samsung official, the Hub isn’t being sold in Korea because the market for DIY smart homes is relatively small compared to the U.K. or U.S. especially since Koreans live in apartments that already come with smart technologies embedded. 현재 스마트싱스의 스마트 허브 제품은 미국과 영국에만 판매되고 있다. 삼성전자는 이 제품을 한국에 들여오지 않는 건 주거 형태가 다르기 때문이라고 설명했다. 미국이나 영국은 단독주택이 많아 DIY 형태의 스마트 홈 시장이 더 큰 반면 한국은 아파트 거주 인구가 많고, 아파트 자체에 스마트 홈 기술이 내장돼 있기 때문에 별도의 스마트 허브가 필요 없다는 것이다. Samsung’s Korean rival, LG Electronics, has been working with Google to connect Google Home, a voice-activated virtual home assistant, with LG’s home product line SmartThinQ. LG전자는 최근에 구글과 협력을 해서 LG전자의 가전 라인인 '스마트씽큐' 브랜드 제품을 구글의 음성 인식 스마트홈 비서인 구글홈과 연동될 수 있게 했다. Market analysts believe 2017 will be the pivotal year when the smart home market expands exponentially, and perhaps the biggest factor driving that growth is the wide consumption of speakers running on artificial intelligence. 전문가들은 스마트 스피커가 본격적으로 판매되기 시작하는 올해가 스마트홈 확산의 원년이 될 것으로 기대하고 있다. 이런 스피커는 집안의 가상 비서처럼 일한다. 주인의 목소리를 듣고 “오늘 날씨는 어때” 같은 질문에 답하거나, “음악을 틀어줘” 같은 명령을 수행한다. Ever since Amazon introduced its smart speaker, Echo, to a limited pool of Amazon Prime subscribers in late 2014 and to general consumers in June 2015, sales of the device have significantly grown. The speaker runs on Amazon’s AI system known as Alexa, and different estimates pin sales at somewhere between 7 million and 11 million globally. 아마존은 2014년 스마트 스피커 ‘에코’를 일부 소비자에게 시범 공급했으며, 2015년 6월부터 일반 소비자들에게 판매하기 시작했다. 아마존의 인공지능 시스템 ‘알렉사’에 기반한 이 스피커는 전세계에서 700만~1100만 대가 판매된 것으로 추정된다. Most of the sales have been made in the United States, followed by Germany, according to Morgan Stanley’s research. Amazon dominates the market with 70.6 percent market share in the U.S. alone, according to an estimate by eMarketer. Runner-up Google has a 23.8 percent share with its Google Home service, and it’s quickly catching up to Echo given it was only released last November. 모건스탠리에 따르면 에코는 대부분 미국에서 판매됐으며, 두 번째로는 독일에서 가장 많이 판매된 것으로 추정된다. 이마케터(eMarketer)에 따르면 아마존은 현재 미국 스마트 스피커 시장의 70.6%를 차지하고 있으며, 2위 구글은 23.8%를 점유하고 있다. 구글의 스마트 스피커 ‘구글홈’이 지난해 11월 출시된 것을 감안한다면 구글홈이 에코를 빠르게 추격하고 있는 셈이다. Apple has also thrown its hat in the race. Last week at the company’s Worldwide Developers Conference, it unveiled the HomePod, a speaker that will work in tandem with Apple’s HomeKit, a platform that allows hobbyists to build their own smart gadgets. The speaker will run on Siri, the same feature found in the iPhone. 애플도 이 경쟁에 합류했다. 지난주 애플은 ‘월드와이드 개발자 컨퍼런스’에서 스마트 스피커 ‘홈팟’을 공개했다. 홈팟은 애플의 ‘홈킷’과 연동되는 스피커다. 홈킷이란 애플의 개발자들이 스스로 스마트 기기를 만드는 플랫폼이다. 이 스피커에는 아이폰의 인공지능 ‘시리’가 내장됐다. During the annual conference, Apple focused on promoting the music experience that HomePod will deliver, including access to a library of 40 million songs through an Apple Music subscription. “We want to reinvent home music,” Apple CEO Tim Cook said at the event. 애플은 홈팟이 4000만 곡의 보유 음악 등을 통해 더 나은 음악 체험을 가능하게 해줄 것이라는 점을 강조했다. 애플 CEO 팀 쿡은 컨퍼런스에서 “우리는 집안에서 듣는 음악을 재발명하기를 원한다”고 말했다. Market observers believe HomePod is just an entry point for Apple into the larger smart home realm. 전문가들은 홈팟을 애플의 본격적인 스마트홈 시장 진출 신호탄으로 보고 있다. Philip Schiller, Apple’s senior vice president on worldwide marketing, noted the speaker’s home assistance feature can read and send messages; receive updates on sports, news and weather forecast; and control smart home devices, switching lights on and off and closing and opening shades, all through voice command via Siri. 애플의 글로벌 마케팅 부사장 필립 실러는 컨퍼런스에서 홈팟이 음성 기반 인공지능 서비스 시리를 통해 가상 비서로서 기능할 수 있다고 밝혔다. 메시지를 읽거나 전송할 수 있고, 스포츠 소식이나 날씨 예보 등의 뉴스를 업데이트할 수 있으며, 전등을 끄고 켜거나 커튼을 내리고 올리는 등의 스마트홈 기기 컨트롤 기능도 갖고 있다는 것이다. 실러는 “당신이 만약 집안에 홈킷을 설치한다면, 당신은 홈팟을 통해 집 안의 스마트 기기들을 컨트롤할 수 있다”며 “홈팟에 홈킷이 내장되어 있기 때문에 전 세계 어디서건 당신의 명령을 아이폰이나 아이패드에 있는 앱을 통해 전달할 수 있다”고 설명했다. In Korea, telecommunications companies have been releasing their own smart speakers, SK Telecom with Nugu and KT with Genie. Samsung is expected to enter the race by applying its Siri-like AI system Bixby. 한국의 경우 통신회사 SK텔레콤이 자체 개발한 스마트 스피커 ‘누구’를, KT는 ‘지니’를 선보였다. 삼성 역시 자체 개발한 AI 시스템 ‘빅스비’를 통해 경쟁에 뛰어들 것으로 전망된다. Some tech companies have been developing products with the specific goal of improving life for senior citizens living alone. 혼자 사는 노인들을 위한 제품들을 개발하고 있거나, 판매중인 회사들도 있다. One of the companies is Softbank Robotics in Japan, where the population is among the world’s fastest aging. 일본의 '소트프뱅크 로보틱스'는 그런 회사 중 하나다. 일본은 고령화가 빠르게 진행되는 나라다. At the Mobile World Congress earlier this year, the company’s sales director, Nicolas Boudot, said the company is working on a software platform that will help its famed humanoid robot, Pepper, perform various tasks like tending to senior citizens through Android-powered apps. Since 2015, the company has sold 10,000 Peppers, mostly for business use. 이 회사의 세일즈 디렉터 니콜라스 부다트는 올해 초 스페인에서 열린 ‘모바일 월드 콩그레스’에서 휴머노이드 로봇인 ‘페퍼’가 노인 돌보는 등 다양한 일을 수행할 수 있게 하는 소프트웨어 플랫폼을 개발 중이라고 밝혔다. 이 플랫폼은 안드로이드 앱을 통해 실행될 것으로 예상된다. 2015년 이후 이 회사는 1만 대의 페퍼를 판매했는데 판매된 페퍼 대부분은 기업용이었다. In Europe, an EU-funded research consortium is testing out a prototype of Zacharias, a robot that tends to the elderly, with several volunteers. One of them is Aggeliki Koukoutsi, a 68-year-old woman living alone in Greece who suffers from mild arthritis. The robot records her walking speed and patterns, and when there are signs of unusual movement, it is sends an alert to the doctor and family members. 유럽의 한 컨소시엄은 EU의 투자를 받아 자원봉자사들과 함께 노인 돌보는 로봇 ‘자카리아’를 테스트하고 있다. 이 로봇은 현재 그리스에서 관절염을 앓고 있는 68세 독거노인 아게엘키 쿠오우코우시의 집에서 머물며 그의 걸음걸이와 행동 패턴 등을 관찰하고 있다. 로봇은 평상시와 다른 이상 움직임을 감지하면 바로 가족과 담당 의사에게 신호를 보낸다. Korean companies have also been working on smart devices that can help with senior care. Like Japan, the country faces the challenge of a quickly aging population. 일본처럼 급속한 고령화를 경험하고 있는 한국에서도 노인을 돕는 스마트 기기들이 개발되고 있다. SK Telecom is hoping to introduce a “silver care service” in partnership with the state-run LH Corporation. SK텔레콤은 LH공사와 함께 ‘실버 케어 서비스’를 제공할 계획이다. The service would install a sensor in a senior citizen’s home and alert family members when there is no human activity detected for more than 12 hours or when electricity and water use drops significantly. 이는 센서를 통해 12시간 이상 집 안에 있는 사람의 움직임이 포착되지 않거나 전기와 수도 사용량이 급격히 줄어들면 바로 가족들에게 연락해 주는 서비스다. LG U+, another telecom company, announced last year it was working with Samsung Electronics to develop a refrigerator that will send alerts to family when the door is unused for more than 12 hours. LG유플러스는 지난해 삼성전자와의 공동으로 냉장고 문이 12시간 이상 열리지 않으면 바로 가족들에게 경고 신호를 보내주는 기술을 개발 중이라고 밝혔다. However, these technologies are still at a stage where they can only monitor senior citizens rather than be a companion to them. 하지만 이 모든 기술들은 아직 관찰하는 수준이며, 노인들에게 정말 필요로 한 동반자 역할을 해주는 단계에 이르지는 못했다. The smart home market still faces the hurdle of consumer accessibility. Kim Chul-young, an analyst at KB Securities, said full adoption of the smart home will require prices to go down first, which could take some time. 스마트홈 시장의 가장 큰 걸림돌은 바로 소비자 접근성이다. KB증권의 김철영 애널리스트는 스마트홈이 보편화되기 위해서는 가격이 낮아져야 한다고 지적했다. 김 애널리스트는 “지난해 LG스마트 냉장고의 판매가는 600만~700만원 대였다”며 “소비자가 지갑을 열기 시작하는 가격대는 200만원 대인데 이 정도로 가격이 떨어지려면 2~3년은 걸릴 것”이라고 말했다. Price is not the only factor holding back wider adoption of smart homes. There are also critical concerns about security. 보안에 대한 우려 역시 스마트홈 확대를 가로막는 걸림돌이다. In October, popular websites in the United States, including Twitter, Netflix, Spotify and The New York Times, were paralyzed after a DDoS, or denial of service, attack. Experts said the attack was made through Internet of Things-connected devices, which were easy to hack. 지난해 10월 트위터·넷플릭스·스포티파이·뉴욕타임스 등 미국 주요 기관들의 웹사이트가 디도스 공격을 받아 마비됐다. 전문가들은 보안이 약한 IoT 기기들을 통해 디도스 공격이 이뤄졌다고 분석했다. “After the massive DDoS attack last year, awareness about security in smart home devices increased,” said Christine Kim at IHS Markit. IHS마켓 킴 애널리스트는 “지난해 대대적인 디도스 공격 이후 스마트홈 보안에 대한 관심이 높아졌다”고 말했다.